Eight-year-old African-American Alfleta “Alfie” Jakes is completely bored. With three weeks left of her summer vacation, she wants something to do. Older brother EllRay hangs out with his friends, and her parents are busy working. Nobody seems to have time for Alfie. Her mom decides she can hang out with white Hanni Sobel. This is a great idea except that Hanni is “a know-it-all who tried to be the boss of the other girls.” Surprisingly, Hanni makes a good playmate, especially since she has three cute kittens. Soon Alfie is obsessed with a little gray kitten she names Princess. Alfie really needs this kitten. She devises Operation Kittycat, a foolproof plan to get a kitten home. But her parents have a no-pet policy. Will Alfie be able to pull it off by the time summer ends? Warner’s charming protagonist, whom some may recognize from the chapter-book series about big brother EllRay, will captivate readers with her funny takes on her family and Hanni. Friendly and appealing illustrations by Malone pepper the chapters, adding a sweet dimension to the story. 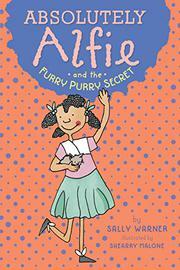 Sequel Absolutely Alfie and the First Week Friends publishes simultaneously.